The Green Dragon Lake District (GDL) is a new development zone in the planning phase located 25 kilometers southwest of Tiananmen Square, that covers 10 square miles. In August 2013, GDL became the second SEBIZ business district when top officials signed a memorandum of understanding. This District is currently in the planning and design phase and project managers at China Development Orient have affirmed their commitment to integrating world-class sustainable energy planning, building design principles and clean energy technologies into the development of the District. The SEBIZ team is collaborating with stakeholders to provide research and technical assistance related to comprehensive energy planning for advanced building design principles and clean energy technologies. 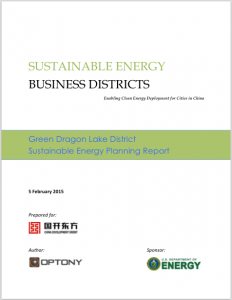 The goal is to develop a framework for district‐level sustainable energy planning and design standards that can be integrated into Green Dragon Lake District planning and replicated in the future across China and globally. Left Photo: China Development Orient receives official Letter of Recognition from the U.S. Department of Energy for their participation in the SEBIZ program. 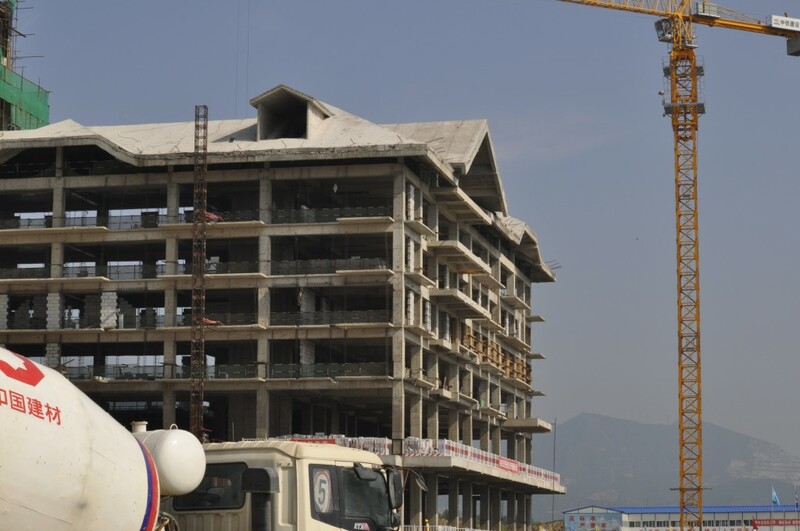 Right Photo: First hotel under construction in the GDL District. The District will be occupied by organizations from the public and private sectors and is envisioned to become a world-class multicultural convention capital. 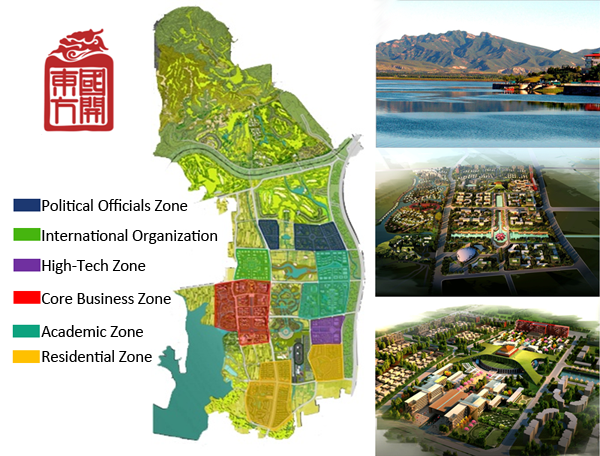 As illustrated in the figure below, the core business zone will be situated in a prime location next to Lake. Other District occupants will include a university with on-site student housing, luxury hotels and villas, hi-tech companies, service industries, recreation and leisure activities. Click here for detailed information about this project. Through participation in the SEBIZ program, the Green Dragon Lake District intends to maximize the deployment of energy efficiency and renewable energy technologies in buildings throughout the District by incorporating global best practices into the planning, design and construction phases. The SEBIZ team is taking the lead in connecting motivated buyers with qualified clean energy vendors early in the planning process in order to incorporate the following technologies into the design phase. The goals are to build a portfolio of technologies and qualified vendors that will contribute to the construction of high-performance buildings that maximize building efficiency, distributed renewable power generation, and other smart grid technologies such as electric vehicles and energy storage. Below is a list of relevant clean energy technologies. The goals are to build a portfolio of technologies and qualified vendors that will contribute to the construction of high-performance buildings that maximize building efficiency, distributed power generation and other smart grid opportunities such as electric vehicles and energy storage. The SEBIZ team is helping facilitate project development and issued a Request for Information & Qualifications on behalf of project developers. Through the RFI/Q process, participating vendors are being introduced to buyers in order to explore current and future clean energy project opportunities. The SEBIZ program team researched and documented the relevant clean energy technologies, policies, programs, and incentives necessary to facilitate implementation of the SEBIZ program in Green Dragon Lake. Access the report by clicking on the image below.